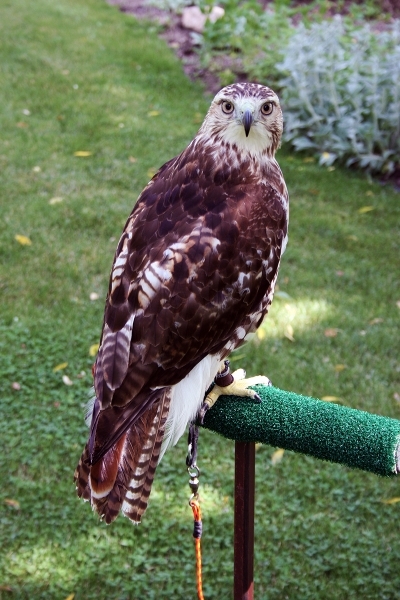 Summer is usually the quiet season for Red-Tailed hawks in Falconry. The main focus during the warm season is to stay fat and happy, and to grow new feathers for the fall. This is especially important for young juvenile Red-Tailed Hawks that are gaining their namesake feathers for the first time. Keeping a hawk well fed through the summer months ensures that the feathers grow full and healthy in preparation for the next hunting season. Cedar continues to enjoy her time out on the perch and has a couple of red-tail feathers just starting to come in. More updates as the summer months progress.